An article by Christina Martin from LifeSiteNews touches on a rap song with over 6 million views that reveals the pain and regret of a father after abortion. 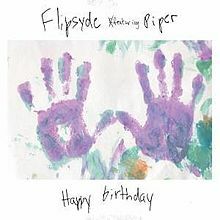 Jun3 25, 2013 (LiveActionNews.org) – Flypside is a band that’s birthed out of Oakland, California. Featuring Piper (MC), Steve Knight (vocals, acoustic guitar), and Dave Lopez (lead guitar)…Another single from their debut album called “Happy Birthday” became a top-3 hit in Germany….What causes this song to continually draw in viewers? Have you noticed a slow but encouraging increase in articles/media/music that touches on what has for a long time been a silent pain? I was very grateful for the author sharing a link to the Silent No More Awareness Fatherhood Forever page as we work together to raise awareness, share resources for healing, provide a place where men can share their abortion regret and after a healing program to join other men in speaking publicly about their abortion regret. This entry was posted on Wednesday, June 26th, 2013 at 4:51 pm	and is filed under Uncategorized. You can follow any responses to this entry through the RSS 2.0 feed. You can leave a response, or trackback from your own site.